Just Toyota’s luck that the most flairful Camry it has ever conceived should become the guest that turns up just when the gathering is winding down. Can it get the medium sedan party restarted? Yup, times are tough in this sector. And it’s nothing new. 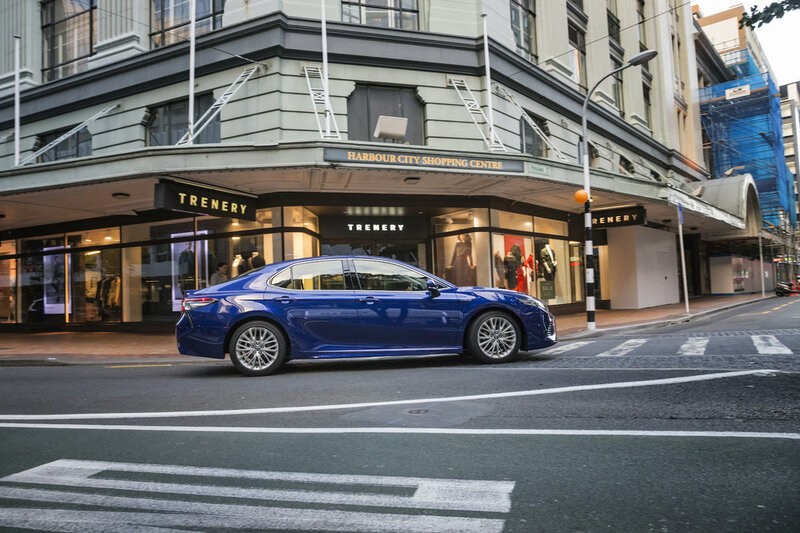 That comment was from a Toyota New Zealand spokesman at time of the release of the seventh generation Camry, the last we received from Australia. The good news is the category hasn’t diminished much more since then. The bad, for those few who still try to earn a living from it – and there are far fewer combatants in the ring now than when I took that quote back at the end of 2011 - is that it hasn’t revived, either. Thus, while Toyota has remained the category kingpin all this time, and even recorded increasing market share, that’s something of a hollow victory. It’s just achieving a bigger slice of a cake that has progressively become smaller. It’s been years since it figured in the top 15 passenger count. In 2014 Camry achieved 1043 national registrations, which though double the count for the next highest-placed car (Ford Mondeo), was still 309 units down on 2013 and 459 short of the 2012 tally. It barely reached the four-digit zone in 2015 and 2016, then finally fell short last year, with just 908 finding homes. Speaking of. The top selling edition these past few years has been the hybrid, for more than good Green reason. It’s now the country’s cab of choice. Which means that, for most examples, the majority of time spent at residential addresses was to drop off or pick up paying passengers. The taxi ranks’ file to Camry began before the Falcadores they used to favour went extinct. Busy drivers started abdicating the big Aussies after they found the saving in running costs would recoup their battery-assisted buy-in within a single year. But, any way, in summary, Camry is no longer the sales giant it once was and most you now see are bought for work. And, given that this trend is now so entrenched, you’d have to think nothing will change for the just-arrived gen eight model. That thinking would seem to drive Toyota NZ's decision to deliver three battery-assisted models – the $41,490 GX, $42,990 SX and $49,490 ZR – and an entry $35,990 GL, with a 2.5-litre petrol four from the old line. These editions will together account for almost all sales, TNZ believes, with what the brand now prefers to describe as ‘self-charging’ models (to differentiate from its sole plug-in rechargeable car here, the Prius Prime) cumulatively accounting for 70 percent of all that volume. From the tenor of everything above, you’ve probably steeled yourself to read on about yet another Camry that aces on nothing more than reliability, value and space. And yet, even though there’s every chance this edition will continue to uphold tradition in those respects, it would be unfair to think that’s all it has going for it. The switch back to being built in Japan, the transference to the brand's new-age scalable Toyota New Global Architecture (TNGA) architecture and the introduction of a brand-new eight-speed automatic transmission, albeit to just one edition, are hardly unexpected revisions. What does surprise is that the car is a bit different to how it used to be in character, too. It’s definitely more interesting in respect to the styling, inside and out, and might well also prove to be less servile in its driving than the last one, too. 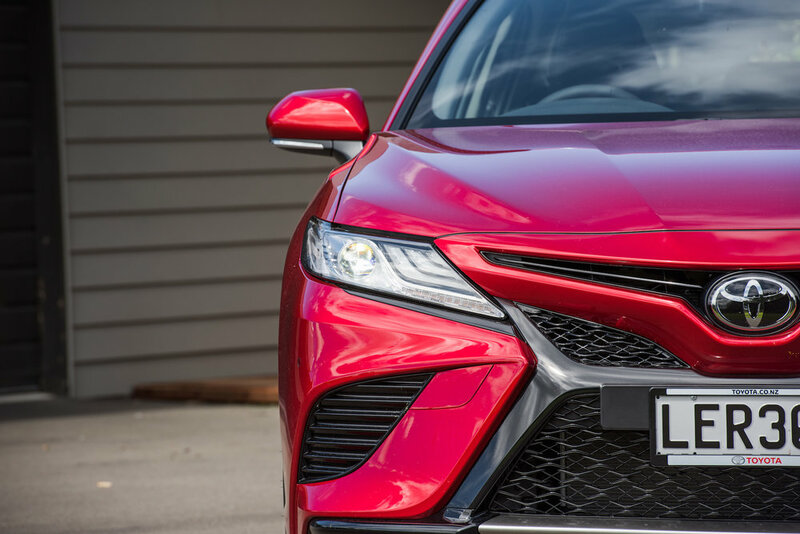 This sort of stuff might not matter one way or another to the fleet beancounters who will undoubtedly continue as Camry’s primary funders, but it will be good news to those who will drive the model for pleasure. More importantly, it will be a relief to the car’s engineers and designers because, the story goes, this Camry was another of those Toyota models that company president Akio Toyoda decided had become too staid for its own good. It’s said he direct-ordered his chiefs to greenlight some of the designers’ bravest sketches for production, and to inject some real driving character and agility into the mix. The version that might well best demonstrate the degree of success has to be the one that stands as a joker. It’s been years since Camry has carried a petrol V6 and, though it was known that America and Australia was committing to the new model in this format, it might certainly surprise that TNZ has also taken the plunge, albeit with a single offer, simply badged as the V6, which will cost $47,990. This edition is being touted as a replacement for the now-defunct Aurion, but let’s hope they don’t mean that too literally, because in its last years Toyota’s Aussie-brewed and Camry-derived large sedan was an increasingly hard sell, and rightly so. The new ‘six’ was the model I got to spend most time in during the media launch day. I suspect it will present as a massive leap forward, but won’t stick my beck out on that one quite yet because the entire Camry driving experience was a lamentably brief exposure - just 30 minutes’ behind the wheel and the same amount of time passengering then another six or so minutes experiencing it on Hampton Downs’ race circuit (not exactly a natural habitat, but at least allowed greater rein-loosening than would be sensible in the public arena). I’d have to say it’s still a stranger to me, albeit less so than the hybrid, whose sole exposure amounting to three track laps. (And the 2.5 entry car? It did not seem to have been invited to the media party). All I would say is that, from the look and limited feel of it, the biggest-engined model should not be considered an appliance. A drivetrain that otherwise represents locally in the Highlander has quite a lot more power –a healthy 224kW at 6600rpm and 362Nm of torque at 4700rpm – and quite a lot less weight to haul than in its alternate application. Outright smashing sizzle is not this mill’s style; it asks for high engine speeds and massaging of the transmission to nail its sweet spot, but the reward is a surge of smooth shove that makes you smile. This engine alone takes the eight-speed automatic, which is understandably better than the hybrid’s CVT and the GL’s six-speed, even though in its sports setting it doesn’t kick down that quickly. The ‘manual’ mode is a falsehood, too; the transmission ECU will ultimately over-ride. I’d not hold hope, either, that the claimed 8.7L/100km optimal economy is possible it you push. YEt, overall, it is a really promising car. Too soft to figure in Government’s EV strategy, because it allows for an electric motor to assist the petrol engine rather than take over from it for prolonged driving, the petrol-electric Hybrid Synergy Drive nonetheless also continues to fly a flag for sensibility. It continues with nickel-metal hydride batteries that, while less efficient as those in-vogue lithium-ion units demanded by more enhanced electric drivetrains, are a lot cheaper. The electric motorset now marries to a different, new 2.5-litre engine than before. This one runs Otto/Atkinson cycles to makes 131kW and 221Nm to abet the 88kW/202Nm electric motor. The total system output is 160kW and Toyota's fuel economy claim is as low as 4.2L/100km and no higher than 4.5 (depending on the grade). The first is better than a second generation Prius and a 19 percent improvement over the outgoing car. CO2 emissions of 96 grams per kilometre equal those from the smaller Corolla hybrid. No wonder taxi drivers love it. What's said to be best about this revised system is the reduced noise and vibration intrusion under heavy throttle. Slipping out of the pits showed it to be almost silent driving character at low speeds. Toyota also talks about a less intrusive brake-regeneration system, but at the pace we were asked to keep that aspect became rather moot. While this Camry is much different to the last, it’s not quite one of a kind insofar that the new architecture and many other components are used elsewhere and will assuredly carry over to many more Toyota products. The TNGA platform is far more rigid that the previous underpinning, and assuredly this delivers dynamic benefits; though only to a point. It didn’t take much pushing on to induce body roll, tyre squeal and understeer from either variant in the track test. But, hey, no-one’s claiming that lessons learned from racing a Camry in NASCAR (and, then, in name only as it’s a silhouette category) were expected to apply here. But it feels like a safe, balanced drive and TNGA does allow for ‘right stuff’ actions: The centre of gravity is lower, the wheels push closer to each corner and it’s allowed the fitment of more complex double-wishbone rear suspension, the costs for which have been offset by the platform’s production scale. It’s physically grown, too, and looks better proportioned, not so much because the wheelbase is 50mm longer as because the tracks are wider (10mm wider front, up to 30mm rear) and the roofline is 25mm lower. And, of course, there's the body styling, which I find really appealing. The new grilles (they differentiate depending on the grade) are intriguing, but it definitely has a sharper dress sense than previous editions. SX, V6 and ZR variants come with a sports body kit, and there's a boot lip spoiler on the V6 and ZR, which all add to the visual impact without seeming overdone. The interior follows the same trend: It’s perhaps not as nice as that in the bar-setting Mazda6 but is certainly less dowdy, more ergonomically-sound and more comfortable than before. Again, the more you spend, the more affluent it seems, though personally I’d see no benefit from splashing out on the full red leather upgrade the local accessories team has concocted. The enhanced cabin dimensions, more beneficial longitudinally than laterally, are also appreciated. Akio-san has clearly also decided that Toyota’s historic tendency to hang back on being a trendsetter for advanced features should also now be kyboshed. The previous Camry only delivered a decent spread of safety features halfway through its life but this one starts on much better footing by featuring in all formats Toyota Safety Sense, a package which includes a pre-crash safety system with autonomous emergency braking, lane departure alert with steering assist, all-speed dynamic radar cruise control which can slow the car to a standstill if necessary, and automatic high beam. It is also the first of its kind to fit out with LED headlights, various driving modes to choose from, a head-up display, wireless phone charging plus all-speed radar cruise control. But no Apple CarPlay/Android Auto: Japan Inc’s biggest brand is too stubborn to accept these buy-in assists are superior to the in-house mirroring system it says it will deliver. One day. More driving time is needed to determine how decent the Camry really is, but at first glance, it has stepped up considerably. The Ford Mondeo, Honda Accord, Hyundai Sonata and Kia Optima are all older cars and feel it compared to the Toyota. It should also be considered a genuine threat to the only other fresh design in the fray, the ZB Commodore in its 2.0-litre front-drive formats. Can it win back custom from the considerable count of past users who have now stepped into crossovers and SUVs? It deserves to. Yet reality is that it will very likely be hard-pressed to do so. From the tenor of comment out of the brand, I’d say the hearts-and-minds strategy includes the same element of wishful thinking that my wife applies when buying her weekly Lotto ticket. It seems ironic that this car’s local launch timed, to the day, with the global unveiling of another Toyota model of similar size that achieves, year-on-year, a degree of popularity the Camry last knew more than a decade ago: The RAV4. Sure as eggs we’ll continue to see a lot more of those than these. It’s good to know that the next airport ride you take is going to be in a much-improved car. Yet it would be better still if people bought into this Camry for more than just this.